There is no denying the power of a bright, confident smile, and Dr. Sadeghi knows just how to give you one that lasts. Though there are many whitening products on the market, it’s best to trust Dr. Sadeghi and her expert opinion. Some whitening methods are ineffective and can actually damage your teeth or gums. We also want to make sure you don’t feel embarrassed to come see us at First Dental Associates. There are many reasons our smiles become less attractive over time. Drinking coffee and smoking definitely affect the shade of your smile, but even eating healthy foods like beets and blueberries can cause staining! Call 781-438-1312 to make an appointment for your whiter smile. Teeth whitening is just one of the many ways we provide new beautiful smiles, so feel free to ask about any of our other cosmetic dentistry services. A: Nearly anyone can benefit from a brighter, whiter smile. However, treatment results do vary. Your dental professional can help you decide if you are a good candidate through a careful oral examination that includes a shade assessment. Q: Is whitening safe? Are there any side effects? A: Extensive research and clinical studies demonstrate that teeth whitening under careful dental supervision is a safe procedure. Many dentists consider whitening the safest of all procedures. But please keep in mind that Zoom! is not recommended for young children under 13 or for pregnant or lactating women. Some patients may experience sensitivity during treatment. 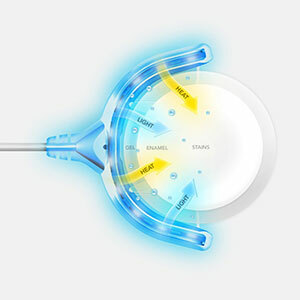 The Glo light generates low heat, which can cause some discomfort. Rarely, minor tingling is experienced post procedure, but this always dissipates. Ask your dentist to provide anti-sensitivity toothpaste prior to treatment if you are concerned. A: Dentist-directed, at-home whitening is one of the most effective ways of brightening your smile. Your custom home-whitening kit involves a special tray that is tailored to fit over your teeth. You also receive prescription whitening gel, which is inserted into the tray before you wear it. Your dentist gives you detailed instructions about how long you should wear the tray each day, and you should expect the entire home whitening process to take between two and four weeks, leaving you with a dazzling smile. Teeth whitening just became a whole lot simpler and safer. 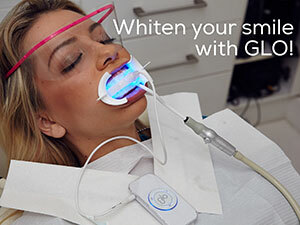 GLO teeth whitening is a brand new option for patients seeking to improve the color of their teeth. GLO can improve your smile by 5 shades in just 5 days! The process is simple. You will begin with the whitening solution (hydrogen peroxide based) on your teeth. You will then place the GLO mouthpiece over your smile. The device combines light and heat to activate the whitening solution giving you a gentle yet effective whitening process without any sensitivity. GLO Dual is an option that begins in our office and continues at your home. You simply take your GLO device with you! You can also use the GLO Professional Take-Home Whitening Kit as a stand-alone product. And don’t forget about GLO Vials, which are great for whitening on the go! Call 781-438-1312 today to schedule an appointment or contact us through our online form. You can have your beautiful new smile soon!